Mahgul for Nasreen Shaikh has been one of the most talented and leading distinguished fashion designers in Pakistan fashion market. This brand has been engaged in catering with the women clothing collections for the last few years and so far this brand has accounted much positive appreciation and remarks from the fashion lovers. Nasreen Shaikh collections are not just appreciable attractive and appealing but they even showcase the culture and trend of some areas as well. Newly, Mahgul for Nasreen Shaikh has revealed her captivating and well designed collection. This collection was shared with the public in PFDC Sunsilk Fashion Week 2013 which was arranged in Lahore Expo Center on 26th April till 29th April, 2013. This whole collection has been offered with the title of “The Archive Collection”. The collection has been showing away the style statements of civil and military styles. The brand has made the use of diverse clothing fabrics that are superior and at the same time premium and finest as well that get along with cotton, satin and organza as well. 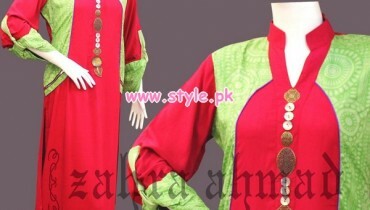 In this collection the women will find waisted shalwars, tops along with the mixture of jackets as well. All the collection dresses have been filled out with a lot bright and much vivid dark intense color shades that are mixed with blue, pink, white, black, purple and so many others. In addition, the embellishment of the outfits has also been completed with the thread work along with the innovative embroideries and patchwork that has made the collection as mind-blowing awesome. Let’s have a look at some of the pictures of Mahgul for Nasreen Shaikh collection at PFDC Sunsilk Fashion Week 2013. On the whole this collection by Mahgul for Nasreen Shaikh has been gorgeously fresh looking and stunningly designed with modishness and sophistication.